Many people in this country have it. You or your partner may have some. Heck, I have some of it. What am I talking about? I’m talking about good ole credit card debt. My credit card debt is currently under $3000. I’m happy because for several years it was over $4000. The amount is getting smaller and smaller each month. I can’t wait until it’s gone for good. People struggle with credit card debt for many reasons. Some have a spending problem while others use their cards as a way to survive. Whatever the reason is, we eventually to break the chains of credit card debt unless it will be with us forever. 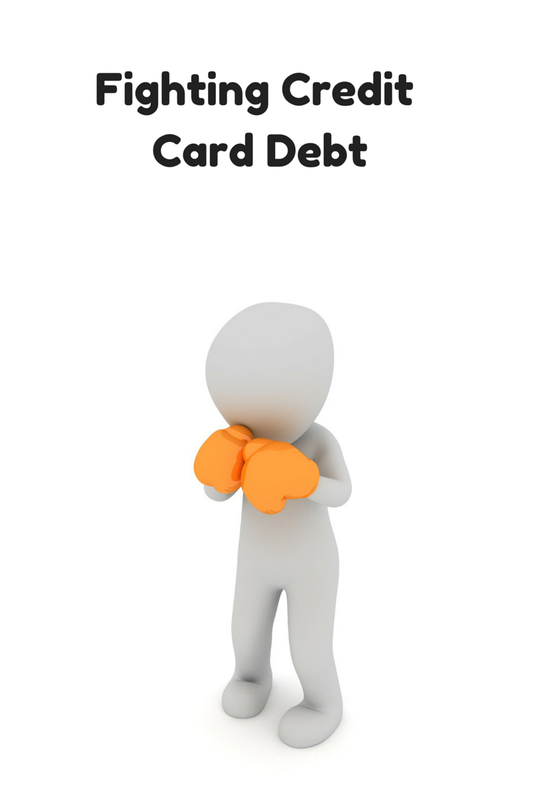 Today, I want to go over some things that anyone can do to help focus on paying off credit card debt. The first thing that you must have is discipline. You have to stop using them. That in itself can be tough for some people. If you’ve been using your credit cards for years, it won’t be easy, but you have to discipline yourself. If you have a hard time doing that have your girlfriend or boyfriend, keep you accountable. Give them your credit cards if you have to. The sooner that you get some discipline in your life the sooner your debt will stop getting higher. If you’re serious about fighting credit card debt, you will find a way to make it happen. As I stated earlier, you have to stop using your credit cards. You have to retrain yourself in the way you think about money and how you spend it. Is what you want to buy a need or a want? If you want it bad enough go to the bank or the ATM and withdraw some cash. Spending physical cash won’t cause you to get into further credit card debt. The final thing that you can do is pay your credit card bill. The minimum amount is fine if you want your credit card debt to last for a few years. Adding extra money to your credit card payment each month will save you money. Your credit card debt will be paid off faster, thus saving you money in interest. One of the minimum payments for my credit card is $30. I apply $100 that card each month. If I make any side hustle money, I apply it to the credit card debt too. I’m serious about fighting and eliminating my credit card debt. I know you are as well. If you’re struggling with making extra payments, get with your partner and come up with some side hustles to help you. If you are dedicated to eliminating this debt, it can happen. Credit card debt can be a never ending cycle of late charges and over-limit fees that increase every single month. Getting out of credit card debt is the best thing you can do for yourself and your family’s financial future. Do you have a lot of credit card debt? How are you paying it off? We have a lot of credit card debt. You really have to be mad and motivated to pay it off. We’re finally making a lot of progress with it this year. I can’t wait to be out of this noose of debt! One hint I’ve seen if you want to keep your credit cards without using them is to freeze them…literally. Put them in a block of ice in your freezer. It will be a big hassle to get to them, so you’ll have to be highly motivated to do so, and it will take time, so you’ll have the opportunity to reconsider. Congrats on taking control and working to get out of credit card debt. Paying off my credit card debt was one of the best things I’ve done for my finances. I’m so glad my parents stressed that if you can’t afford to pay cash for it, or pay the bill in full at the end of the month, you can’t afford it. I’m pretty lucky, the only time I had a decent chunk of credit card debt was immediately following grad school and I landed a job with housing and food covered so I could funnel almost all my money right into paying it off. We have a lot of credit card debt, and the interest is just nuts. It’s really taking a lot of dedication to pay extra every month, but it’s so worth it! Can’t wait to be free! Discipline is the first real step. Otherwise you simply pay it down and then charge it back up – that’s why they call it revolving debt. Most people use excuses instead of discipline. Lots of debt can take a while to pay off, but anyone that stops using their credit card essentially has turned it into a loan – and loans all get paid off eventually, even with minimum payments!